Effective corporate communications help building strong relationship with customers, vendors, suppliers and stakeholders. The Web 2.0 and widespread acceptance of social media did revolutionize how people and companies interact, impacting big ways how marketing is performed in modern days. Relationship, interaction, engagement, conversation are today keywords on Social Media, which are the outstanding media both for private and business purposes: according to «We are social» their penetration rate worldwide is around 50% in EMEA, with a YoY growth of +12%. 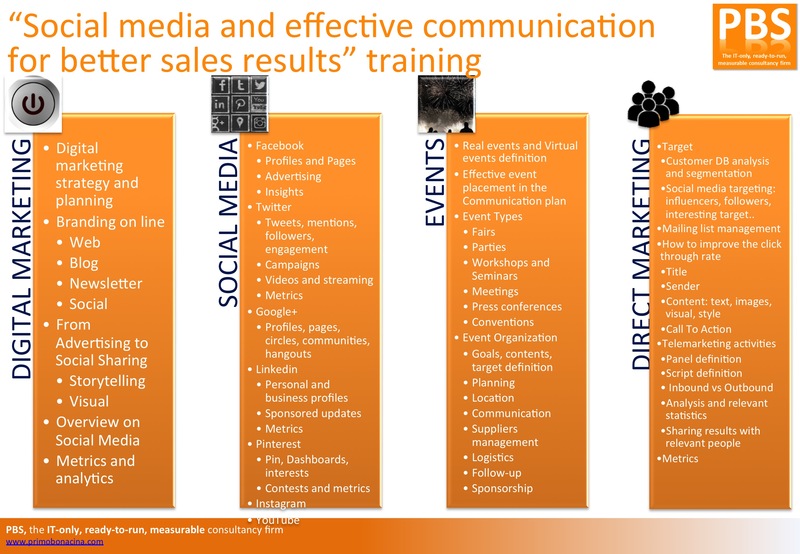 Our training will help you building a comprehensive sales & communication strategy based on LinkedIn, which can integrate traditional activities (advertising, events, fairs, direct marketing) with web-based communication: web site, blogging, social media presence, infographics. Main deliverables will be: sales & communication strategy, planning, implementation, metrics and ROI. Our focus is on activities, which can provide a clear and direct impact on lead generation & business conversation: Digital, Social, Events, Direct Marketing.